EMOTIONAL abuse survivor Michaela Daphne has released the first book in a series aimed at showing women “the signs of a bad relationship”. Purlieu is the first instalment of the Hidden Grove series, a fantasy thriller inspired by Ms Daphne’s experience of being in an abusive relationship for 12 months. Ms Daphne was 18 when she started a relationship with a young Christian man who, for the first six months, made her feel like “I was in heaven”. “And then one by one these (abusive behaviours) became apparent – watching what I was spending, watching what I was eating, taking control of different things in my life,” she said. The relationship ended when Ms Daphne’s father, who had noticed his daughter slipping away from the family and her close friends, intervened. She said it took her six months to realise she was a victim of abuse. 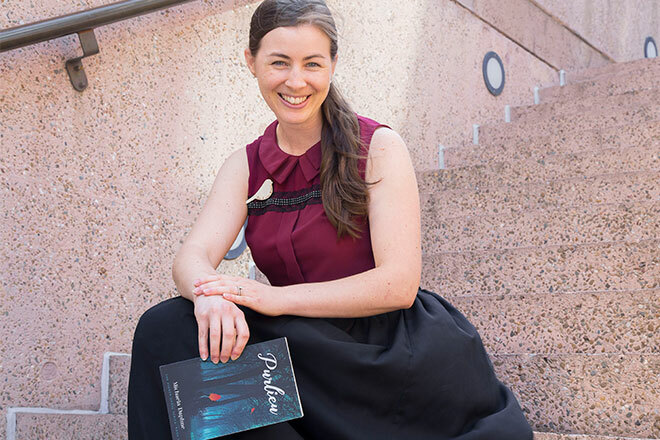 Ms Daphne, who works for the Archdiocese of Brisbane’s Youth Evangelisation Office, began drafting plans for the Hidden Grove series while in the abusive relationship. It has been 10 years in the making. Ms Daphne said the series’ protagonist Evelyn was “blinded by love initially” and taken to a “world where she becomes more in tune” with what was right and wrong. Over the course of the first book Evelyn begins to recognise “the signs of a bad relationship and how not to be treated, but as much that as how to escape that relationship”. “Because that’s one of the biggest steps, making that decision (to leave an abusive relationship),” Ms Daphne said. While the Hidden Grove series is not an autobiographical account of Ms Daphne’s abusive history, the debut author said she wanted the novels “to give young women insights into the signs to look out for”. “For people who have somebody, a daughter or a sister or a friend, who they can see is in one of these bad relationships, they might be able to give them the book,” she said. Ms Daphne hoped the book would show women that they did not have to “sell themselves short” and settle for an abusive partner. “I definitely feel like a lot of women sell themselves short and settle,” she said. “They have such low self-esteem and they’re going online looking for (social media) ‘Likes’ because they want to be built up. “They’re looking for love in all the wrong places. Ms Daphne will spend at least two years finalising the second instalment of the series but is yet to draft the third book. She said she would eventually like to close the abusive chapter of her life “and move on to the happily ever after”. Purlieu will be available for purchase as a print or eBook on Amazon from March 15. Book giveaway: The Catholic Leader is giving away a copy of Michaela Daphne’s debut book Purlieu and a wooden broche to mark the launch of the novel series. Simply send your name, address and mobile phone to editor@catholicleader.com.au with the subject ‘Purlieu Book Competition’.